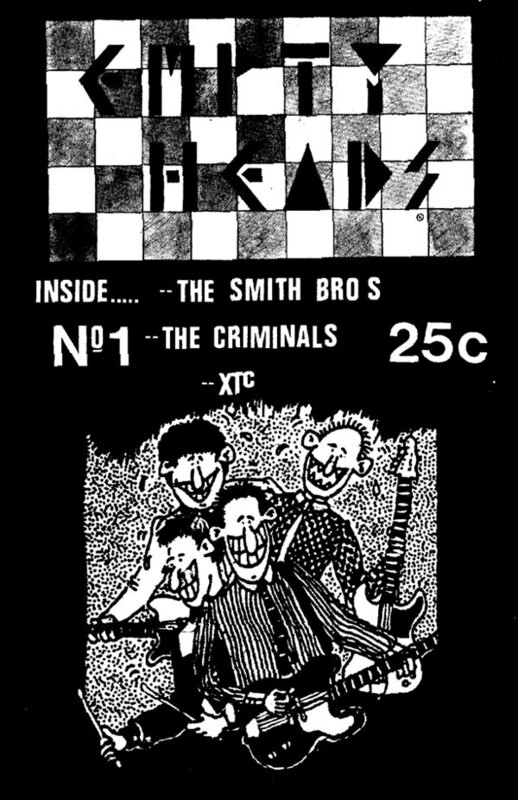 The first era of punk in New Zealand in the late 1970s and early 1980s produced surprisingly few fanzines. 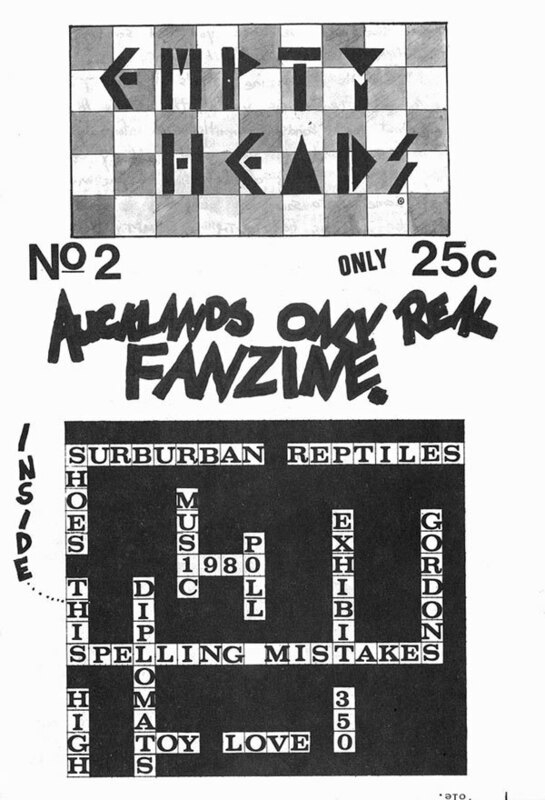 Empty Heads, a printed, folded A4 magazine, edited by photolithographic apprentice and punk enthusiast Paul Luker in Auckland, with help from his mate Phil Yates, was the first. Two issues were produced, in late 1980 and early 1981, and it was available mostly in Auckland. Luker had joined his brother in Auckland inner city suburb Parnell in early 1979 after a brief period in Wellington in 1978 studying journalism. “In the early days I had bugger all money and spent most of my time wandering the town,” recalls Luker. “I couldn’t really help but notice what was happening musically. The Windsor Castle was just around the corner. There was The Globe and Occidental on the way home from work and Knox Hall up the road, RipItUp, Radio B and Barry Jenkin on 1ZM at night. “Auckland was the magnet for the punk movement at this point. It was everywhere when I got here. They were the most active. They had the most interesting posters." “Auckland was the magnet for the punk movement at this point. It was everywhere when I got here. They were the most active. They had the most interesting posters. When I got to know those people I realised how independent and determined to get it done they were. You didn’t pay any attention to TV or radio. You just went ahead and did it." There was a dance at Knox Hall, Parnell with The Dentists and The Sloth Creatures. “It was drunken and riotous and the cops came. The Sloth Creatures played ‘12XU’ for ages. I’d never encountered live music that filled the room so much. It was outrageously loud with a measured aggression that was still kind of secure because you were on the inside and I figured it was right that music should be this exciting. It was a short step to fanzine Empty Heads. “I wanted to get in closer [to the music scene]. I just couldn’t get enough of it. It seemed to be happening everywhere. New Zealand records started to appear. There were loads of posters. We used to nick them. We collected them. It was a real trophy. The first issue sold for 25 cents in Auckland record shops and featured writing and photos by Luker, mainly about groups from South Auckland of a pub rock persuasion. Luker had been doing sound for South Auckland act The Criminals, who’d just finished a New Zealand tour. Luker’s punk tastes predominated in the second issue with stories on Toy Love, The Spelling Mistakes and Shoes This High. Luker’s printing skills were soon co-opted by the busy Auckland post-punk scene. “It was really useful being in the printing industry. Someone always needed something done or had a question. I did film for Shoes This High (The Nose One EP) and The Gordons’ Future Shock EP singles and later artwork for The Newmatics (‘Square One’ from 1982) and Bongos (‘Falling’/ ‘Monotony’, 1982) singles. Luker was ready to make his own music. “I had a belief that making and recording music was possible. My favourite bands were so independent – Shoes This High, The Gordons, Herco Pilots, Skeptics.” Sometime in 1981, Phantom Forth formed. “With so many singles coming out at the time I thought recording would be just as easy, so I bought a 2-track from Oceania Sound. To figure out how to use it I started doing my own stuff fiddling around. I started recording with Mike Neilsen who later did sound for Miltown Stowaways (he would be half of Lava Lava in the 1990s). 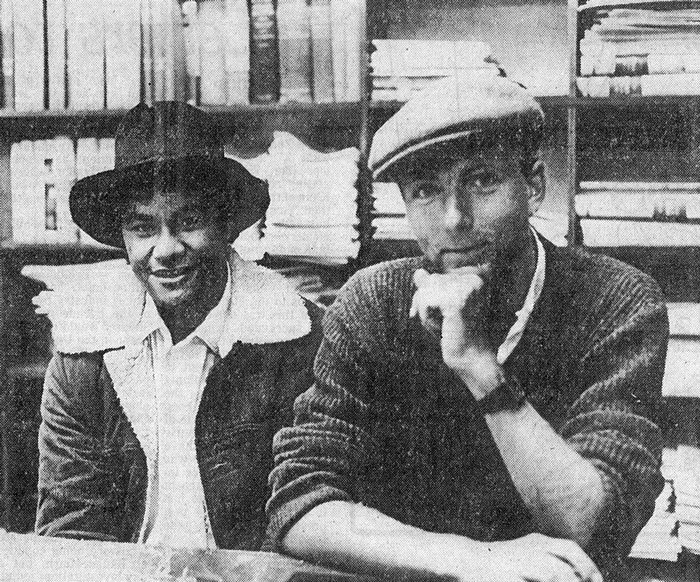 When I came back to Auckland after a nationwide poetry-reading tour with Pule, I flatted with him. He was a guitarist. I bought a Holden amp from a flatmate. He helped me choose a horrible acoustic Yamaha bass. The two of us – The Silver Ferns – we played a few parties. He was really into sound and went off to do that. “I still wanted to do music. Lorraine Steele was around. She’d come back from Britain. She used to hang around with Herco Pilots, who became Coalition. I’d met Deb through Mark [Luker’s brother]. She used to hang around with Nick and Julian Hansen [The Spelling Mistakes]. Deb knew Lorraine. Before we knew it, we had a practice and that was Phantom Forth. “It worked and I was gob smacked that it did. We just plugged and played to a DR55 drum machine. When we started, I was listening to Young Marble Giants. I was quite besotted with that for a while and Cabaret Voltaire, those sort of influences. We got a Roland 606 after that. 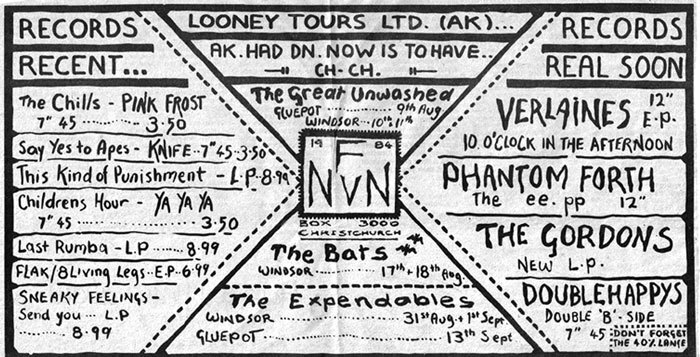 The Auckland post-punk scene was peaking with plenty of venues including the Liberty Stage and XS Café. 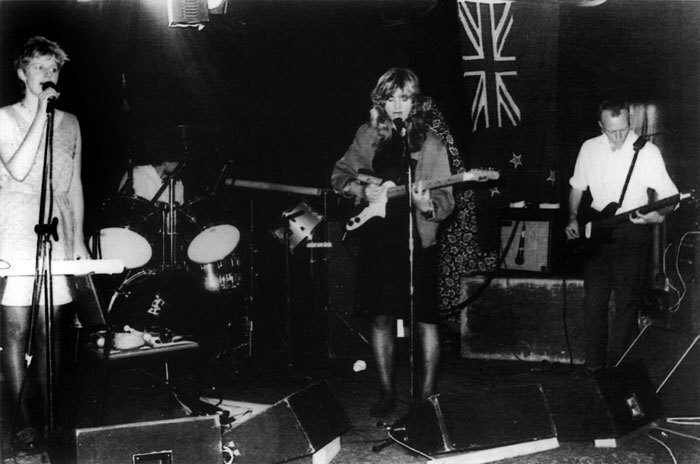 The Auckland post-punk scene was peaking with plenty of venues including the Liberty Stage and XS Café operating in addition to the pubs, which put on original music. Paul Luker the fan was still stepping out. “XS Café seemed to turn really ugly really quickly. Boot boys just seemed to destroy that. We didn’t like any confrontation and getting badges taken off you wasn’t fun. I got hung up over the lit fireplace there one evening. It was weird that place because it was so café. I remember seeing Johnny and the Hookers whack people with the mic stand. By the time the Reverb Room (nee Liberty Stage, on Symonds Street in the Edinburgh Castle) kicked in that was fine. Mind you, downstairs was rough. We’d got sick of it in town, although we went to Squeeze a few times. 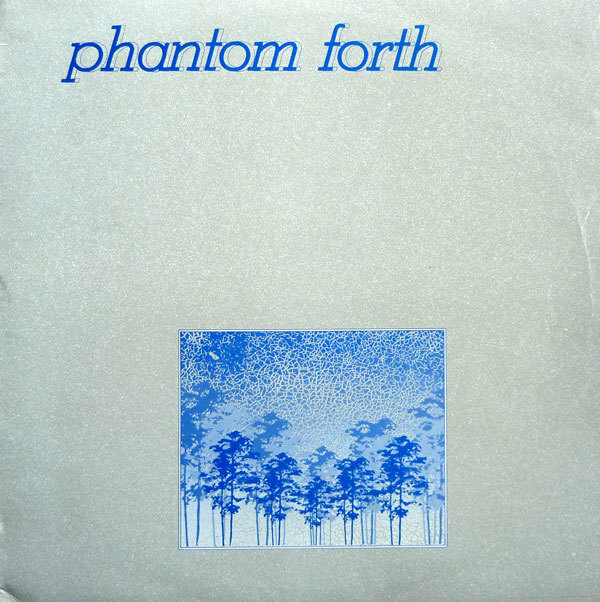 It was 1983 before Phantom Forth became a regular presence on the now fractured and thinning city live scene. They played the final show at the Rumba Bar in Victoria Street on June 6, recording ‘Night Time Falls’ for the Flying Nun live compilation The Last Rumba. The scene survey featured, among others, Tall Dwarfs, The Exploding Budgies, Kevin Hawkins, Children’s Hour, This Sporting Life and The Stones from Dunedin. Phantom Forth could be found the following month with fellow travellers Coalition BC, who’d risen from the remains of Herco Pilots and Kiwi Animal at the Kiwi Animal Dance at Knox Hall. Jewel Sanyo, the scene’s best observer, noted in RipItUp in August that the group’s sound was “a truly danceable fist in the ear” before singling out the “silvery voiced” Lorraine Steele. “That was getting to be our scene then. The idea of “the band” had gone for Brent and Julie (Kiwi Animal) and Coalition and performance had taken over. We’d moved on from just the exhilaration of the punk thrash. It became more of our life. The social politics became more intrinsic with it. Sanyo also noted new member Patrick Waller on cello and drums. Waller (now better known as DJ Dub Head) was playing in Silent Decree, a gothic act soon to release a cassette of studio material on their Sanctus Decay imprint. On November 19, Phantom Forth was at new all age venue SPAM (Society for the Promotion of Alternatives in Music) in Symonds Street with women’s group Marie and the Atom, This Sporting Life and The Stridulators. Four days later, they were at Mainstreet Cabaret for a student radio benefit with 55 Polish Workers, Antibodies and Big Sideways. It was clear there was still a lot of original music being created in the city, but with the exception of a few small run labels no outlet existed to release it. 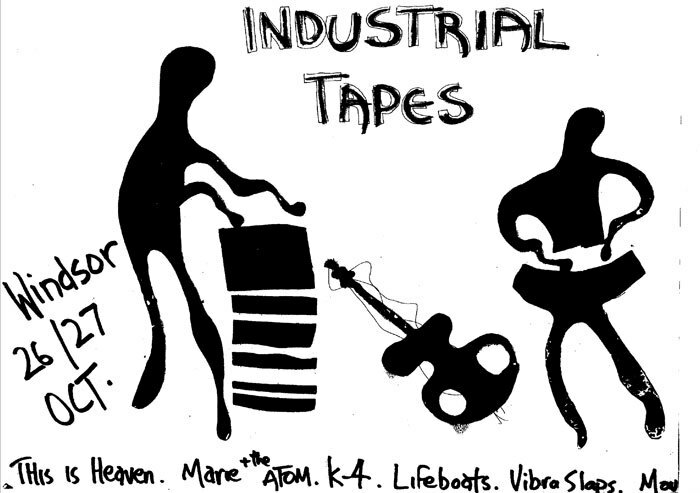 The ever-busy Paul Luker decided to start his own tape label – Industrial Tapes. Few surpassed Industrial Tapes for the quality of packaging, quantity of releases, reach of distribution and innovative sound. 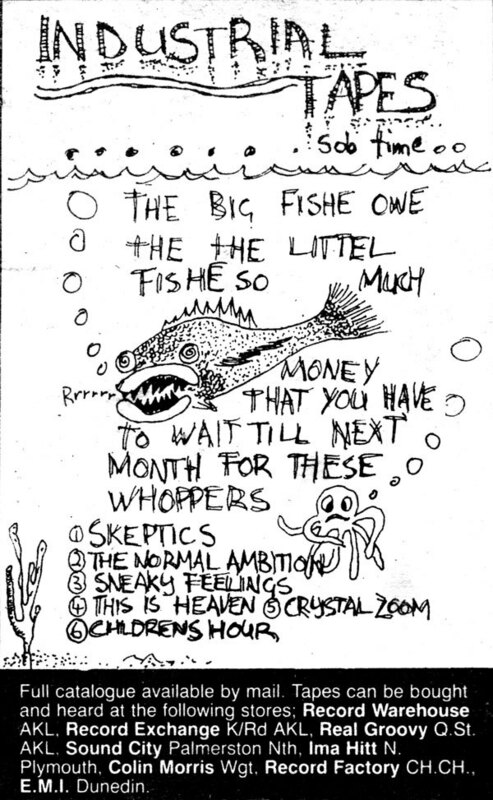 There had already been classic tapes released in New Zealand – House of Squirm’s Gorgonzola, Fetus Productions’ Self Manipulation on Last Laugh, Ima Hitt Records’ Palmerston North compilation Music To Do The Dishes To, Above Ground’s Gone Aiwa, Fishschool’s Present – Pastimes, and The Clean’s Odditties and more would follow over the next few years. Few surpassed Industrial Tapes for the quality of packaging, quantity of releases, reach of distribution and innovative sound. Luker’s printing skills and scene contacts were well used. 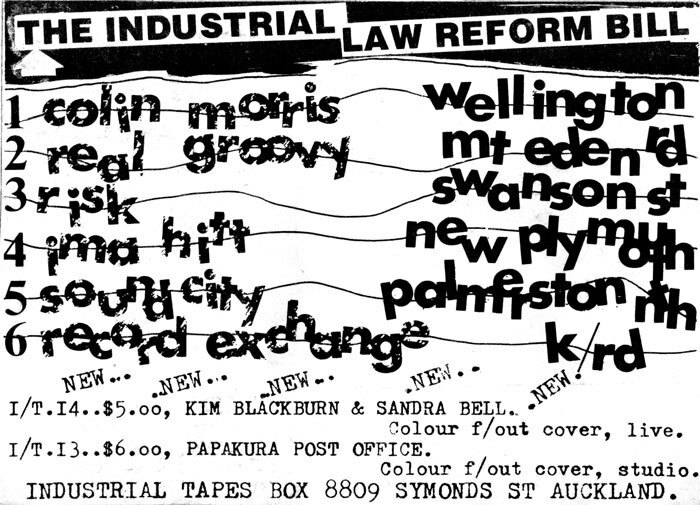 The first Industrial Tapes appeared in December 1983 to lukewarm reviews. First up was Uptown Friday, a live compilation of Kiwi Animal, Heptocrats and Papakura Post Office playing new venue the Old Synagogue in the city. Luker had met Brent Mason of Papakura Post Office at poetry reading. Uptown Friday would eventually sell over three hundred copies. Luker’s experimental project This Is Heaven and the Normal Ambition’s studio recorded Watch It There followed, also selling well. Industrial Tapes rapidly became a vibrant cottage industry for the industrious Luker: “You could buy the blank TDK tape from Direct Imports in Sandringham and you could buy the labels – excellent. I rushed Up Town Friday out even though This Is Heaven was all ready to go. At first I got Direct Imports to dub them. They fucked it up. They left 12 minutes of silence at the beginning so I spent the Christmas holidays hauling the tape out and cutting them for the first three to four hundred. The quality of the packaging, coloured glossy fold out booklets with cool tape labels was always high. It was a feature that stood Industrial Tapes out from the rest of the tape crowd. Industrial’s releases were announced with distinctive ads in RipItUp, where Luker was working part-time. 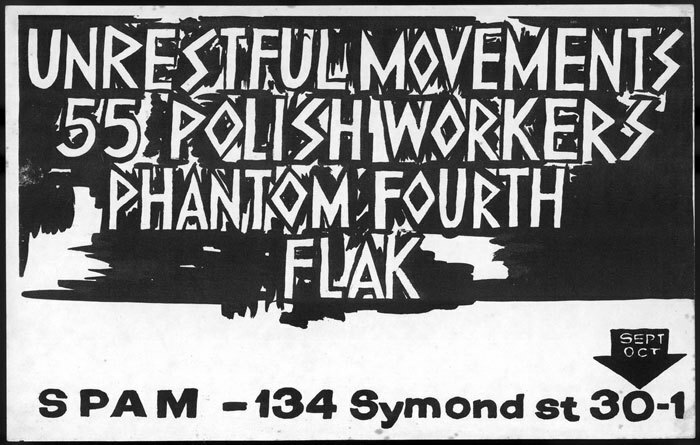 By March 1984 the ad would announce nine releases already available by groups such as Flak, Coalition, Silent Decree, The Normal Ambition, Heptocrats, Ralph Bennett (a Taranaki bluesman) and 55 Polish Workers, featuring future Headless Chickens member Anthony Nevison and future S.P.U.D. and King Loser member Lance Strickland. Marie and the Atom, the Amazing Charlton Heston and the second This Is Heaven release were the other three releases. 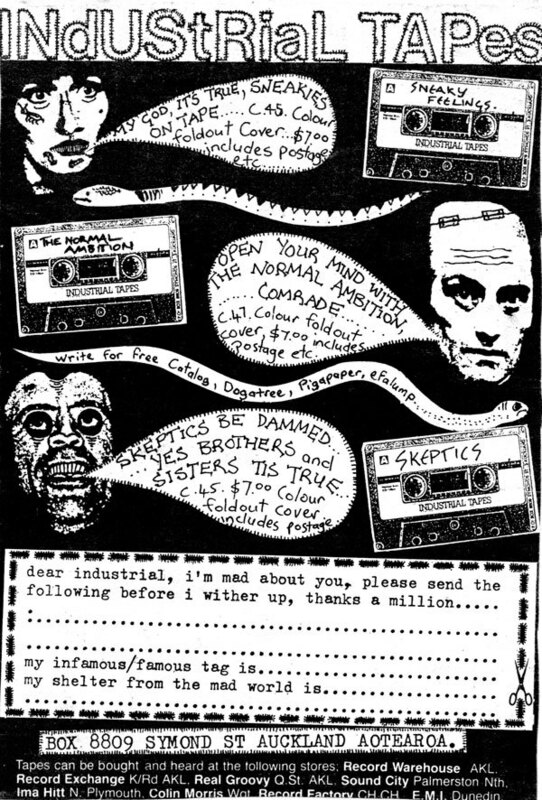 Future tapes were mooted by Skeptics, Albatrocity and Children’s Hour (Luker taped live shows on their first national tour, although the results were never released). 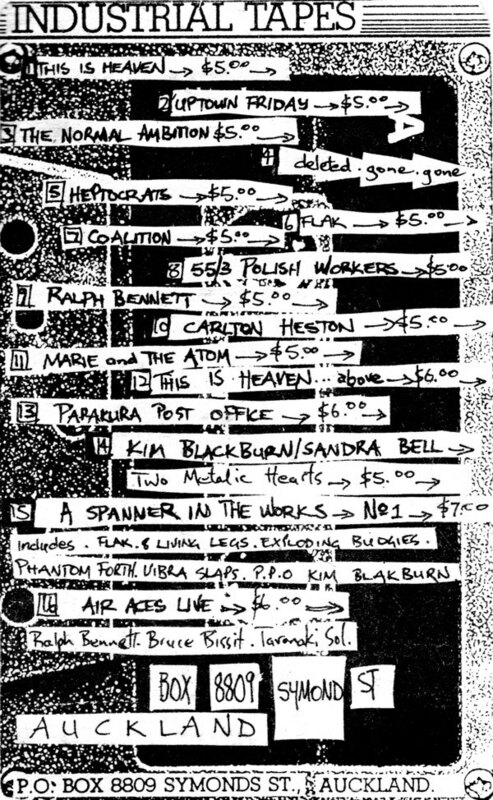 Vibrastraps, Stridulators, Hepers (not released), Papakura Post Office, Silent Decree and Squirm, together with two compilation albums rounded out the list. The new label was now one of the most prolific in New Zealand and the most adventurous. “People would come to me like The Normal Ambition and later Ralph Bennett – people who even in my normally eclectic frame of mind I wouldn’t have touched, but they weren’t that bad,” says Luker. “I said, ‘I’ll make the tapes. How many do you want? I’ll try and sell as many as possible.’ They paid the $1.34 or whatever the tape cost and they got the label and the cover with it. They’d take them away to sell at gigs – whatever. By April, Industrial tapes were available in three Auckland outlets, Palmerston North, New Plymouth and Wellington, adding Christchurch and Dunedin, a month later. In December, Phantom Forth played SPAM’s Christmas Death closing down show with Eight Living Legs, Infectious, Exploding Budgies, K4 and The Vibraslaps. Flying Nun Records wanted an EP from them, which was duly recorded and announced for release as early as March 1984, although continued delays with pressing held up the patchy but still sublime record, The Eepp, until December. Phantom Forth were playing out using a number of drummers including Robert from Eight Living Legs and Chris Williams from Coalition. They could be found on January 24 with 55 Polish Workers at the Globe and at the Windsor Castle on 19 February with Normal Ambition. In April, an abbreviated Phantom Forth minus Debbie but including Hilary Ord from Albatrocity and Patrick Waller, headed south to play the Off The Deep End Improvisational Festival at Wellington’s Thistle Hall on a bill which included Kevin Hawkins and The Stridulators. “We went and played in Palmerston North in Snailclamps on the way. We met Kiwi Animal there. They’d been touring around. Charlton Heston played as well. That was the Skeptics plus mates and they’d get industrial cutters and 44 gallon drums and just make horrendous noises. They used analog synths. “I’d met the Skeptics years before when John Pule and I toured. There was a gallery in front of Snailclamps that we read in. I’d go down to Palmerston North and stay, then we’d go down to Wellington, where it was just so off the edge. I think some of the Wellington bands made it easier to get into experimental stuff up here. They were into mushrooms and cactus and that sort of thing. Phantom Forth ceased playing shortly after but Industrial Tapes rolled on. Releases from Kim Blackburn and Sandra Bell (Two Metallic Hearts), the Air Aces, Sneaky Feelings and the Skeptics (Said See Say) appeared with Spanner In The Works, a compilation featuring The Exploding Budgies and others. 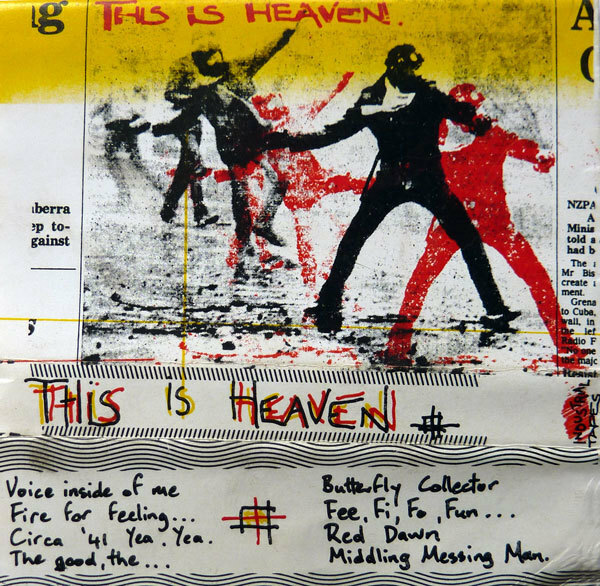 He decided to wind the tape label down and concentrate on This Is Heaven, his solo project. He decided to wind the tape label down and concentrate on This Is Heaven, his solo project. It’d been a wonderful rush of left field sound and enthusiasm with several significant achievements. For the first time since punk began women were playing, performing and recording their own music in all women groups. Industrial Tapes was the main conduit with Flying Nun Records under the influence of Chris Knox. The Phantom Forth’s Eepp (‘March’/ ‘Double Negative’/ ‘Caroline’/ ‘I Don’t Know You’/ ‘Liar’/ ‘Saw You Hide’/ ‘Dead Dream’), with five moody sound sketches of Auckland in the early to mid-1980s, finally appeared in November 1984. 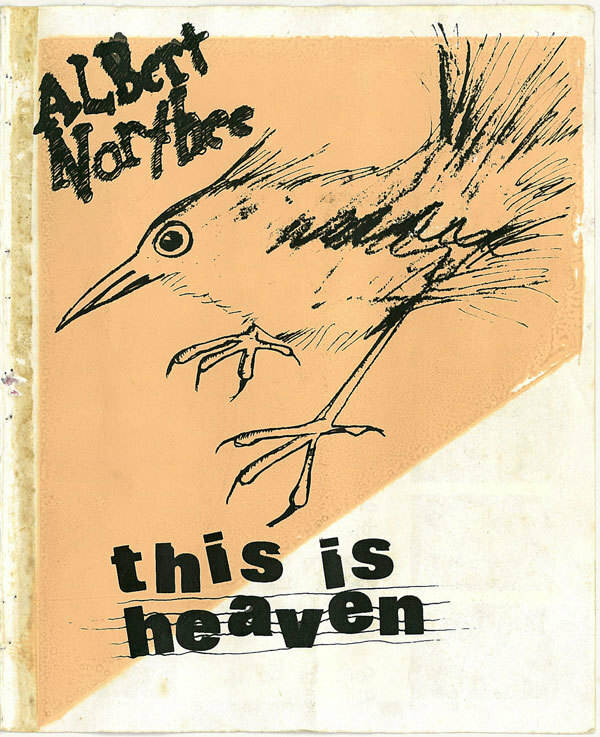 In February 1985, This Is Heaven’s Albert Northee book and tape appeared. 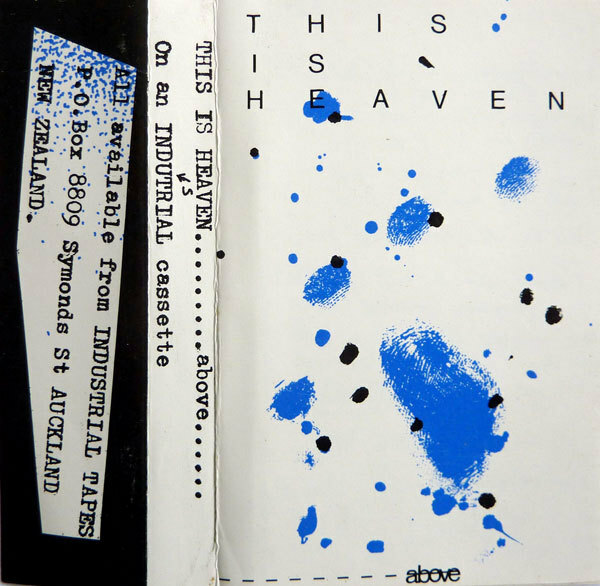 Luker played shows as This Is Heaven at the Ponsonby Community Centre with the Mad Kiwi Ranter David Eggleton in July and the Windsor Castle in October with Vibraslaps. 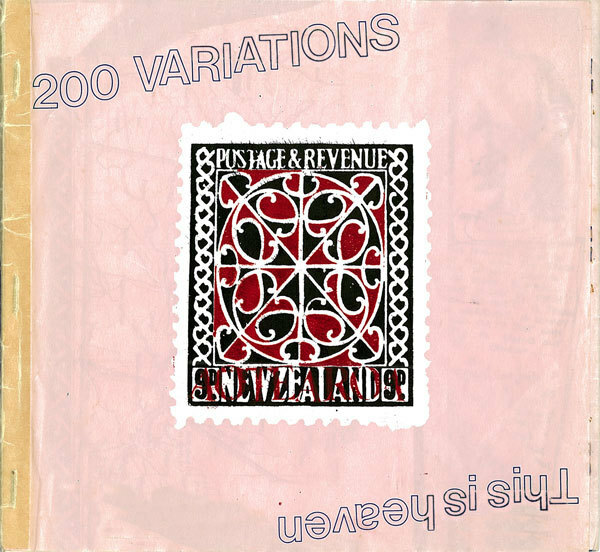 He saw out the year with one of his finest releases, This Is Heaven’s 200 Variations 7” single (‘Battered The Boy’/ ‘Mr Kingdom’/ ‘Turkish Otter Time’/ ‘Things Up The Shirtsleeves’).